However, an opportunity arose to procure a copy of A Work In Progress free of charge through Amazon Vine, and so I took advantage. What I like about the Young Animal titles is that they are operating with a big picture mindset. All of them seem to be going places, and these places cannot quickly be reached. The disadvantage of such storytelling, however, is the possibility that a title could lose a reader early on if not initially dynamic enough. Well, I’m here to tell you, if you gave up on Mother Panic after the first issue, it is certainly worth a revisit. As A Work In Progress, well, progresses, we begin to understand Violet Paige’s past traumas that resulted in her maladjustment. This is a deeply flawed protagonist. She has an agenda, and she does not want to be distracted from it. But, deep within her heart, she allows herself such distractions, especially when saving lives is involved. Jody Houser, the writer, succeeds in providing a terribly complex character who, with each new issue, reveals more and more of herself. Paige’s supporting cast grows with each subsequent installment, and they are equally interesting. (In fact, there is one former bat-villain that specifically delighted me.) Houser’s plot is multilayered, and we quickly realize that this is not a simple revenge story. Happily, Houser is careful to keep some things a secret. I think this is a brilliant move to keep readers coming back. For example, Mother Panic has powers, but it’s not made completely evident what those powers are. She also has some very impressive technology, but we have no idea from where that technology derives. Those two mysteries alone are enough to keep me coming back. Tommy Lee Edwards depicts the first arc’s artwork, and it suits the tone of the book perfectly. It is gloomy, rough, and dark, yet the action is clearly conveyed and the figures are rendered well. Shawn Crystal handles the art duties for the second arc of the book, and though his art is a bit more cartoonish, it still fits both the character and the story very well. Each artist depicts Mother Panic as a primal, almost monstrous, force of nature, not just a woman wearing a costume. 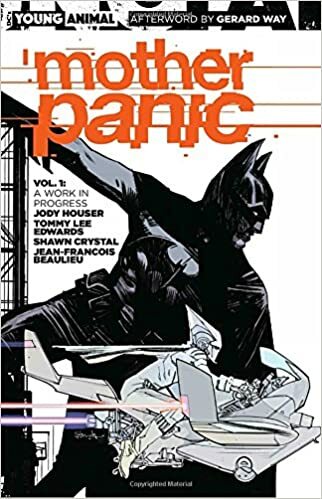 I think it should be noted that, at no point in the book is the character actually referred to as “Mother Panic.” It’s a very cool pair of words, though I’m not sure it’s the stuff of a vigilante alias. I mean, it sounds awesome, but I have trouble picturing the media or criminals choosing it as a moniker. Does that mean Violet Paige herself assigns the designation? I guess we’ll wait and see. Great title for a book, though. Finally, Mother Panic has a very “Vertigo” vibe to it. I feel like it would fit in well next to The Sandman, American Vampire, and Fables. That’s why every time Batman and Batwoman made an appearance, it sort of jarred me. On the one hand, I liked seeing the Bats interact with a violent costumed vigilante dropping f-bombs. Felt more accurate to the Gotham environment. On the other hand, I didn’t feel as though they quite fit in correctly, which made me think they are there just to help sell books. After reading A Work In Progress, Mother Panic stands just fine on her own. This entry was posted in Book Reviews and tagged arts, Batman, batwoman, books, comic books, DC Comics, entertainment, graphic novels, jody houser, mother panic, reviews, shawn crystal, tommy lee edwards, young animal.